A shared value dairy initiative in India fosters entrepreneurship and strengthens local communities through market-driven solutions. Gaurav Shirsath's dairy farm serves as a demonstration unit for other farmers in his community. He also started a milk collection facility to support higher quality milk production. 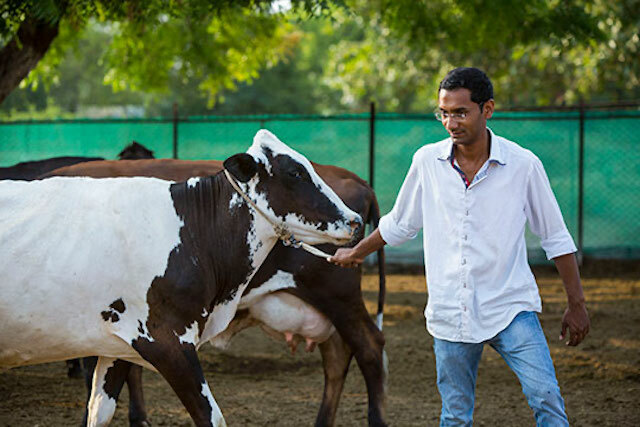 Gaurav Shirsath is a dairy farmer-turned-entrepreneur who represents a new generation of youth in rural India, eager to utilize their education for the benefit of the local community. Based in the village of Kolhar in Ahmednagar district in Maharashtra, Gaurav has taken on the role of Facilitator in a multi-stakeholder shared value dairy initiative launched by the global healthcare company Abbott in association with Prabhat Dairy, with TechnoServe as the technical assistance partner. Gaurav has a diploma in civil engineering and worked in the building industry for four years. However, after his father and his cousins invested in a dairy farm, Gaurav decided to move back to his village to manage the farm. Fortuitously for Gaurav, Kolhar village was selected as one of the five pilot villages for the initiative, which has recruited local entrepreneurs as “Facilitators” to open new milk collection facilities, incorporating vastly improved milk handling and hygiene standards, and equipped with Bulk Milk Coolers (BMCs). Spotting the opportunity, Gaurav signed up for the program and currently operates a model milk collection facility in Kolhar. Many farmers in rural Maharashtra state in India have taken on dairy farming as a means to increase their income. 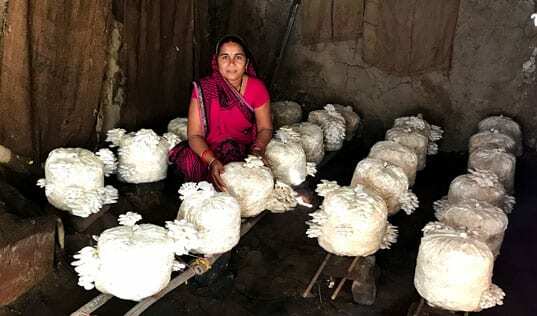 Milk produced in Maharashtra is typically characterized by aggregating the milk from thousands of smallholder farmers with only a small number of cows each. Gaurav’s story is just one of many examples of how the initiative is helping farmers across the region. 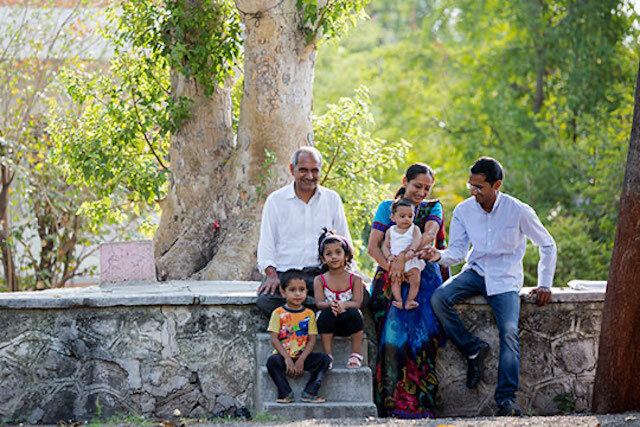 Prabhat Dairy Ltd, an integrated milk and dairy products company that sources milk from these farmers, has been deeply invested in rural Maharashtra since 1998, and in recent years has supplied milk for Abbott's growing nutrition business in India. By 2015, the time was right to strengthen the association and aim at sustainable sourcing to create stronger farming communities. 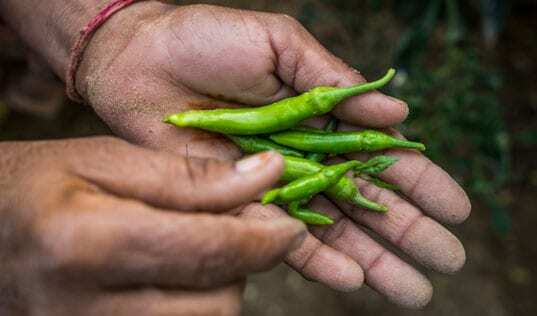 After an extensive survey of Ahmednagar district in Maharashtra, ten villages were identified as the locus for a pilot project that aimed to create value for both business and local farming communities. The initiative involves building infrastructure and dairy farmer capacity in an effort to support the production of high-quality milk via a high-quality milk supply chain. 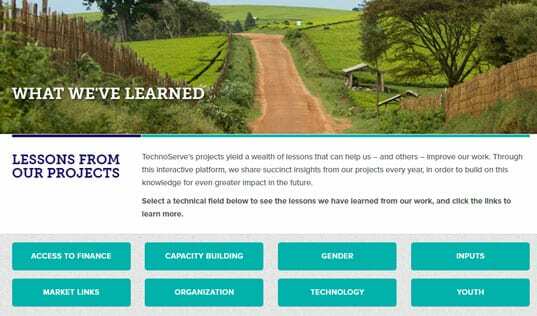 TechnoServe’s mandate is to design and implement customized training programs that are meaningful for smallholder farmers – especially women farmers – including trainings on animal breed and husbandry, feeding and animal care, as well as financial literacy and the business of dairy farming. Training on clean milk production also is a priority to ensure milk is free of antibiotics and aflatoxin. Looking ahead, training programs will continue to be refined to ensure they meet the needs of both farmers and the business. Seeing the business opportunity in his family's dairy farm, Gaurav decided to leave his engineering job and move back to his village. Gaurav applies all the technology he can afford. He has a milking machine, and regularly vaccinates and deworms his cattle. But he also advocates simple interventions and considers himself smart at cutting costs. He practices open farming, and precisely controls the diet of his cows, economizing on fodder while maintaining cattle health. Early results in the first five villages are encouraging. In addition to Gaurav and the other four village Facilitators, the initiative is providing a multi-faceted array of training and support for farmers across the region, with more than 700 farmers already participating in the program since initial efforts began in March 2016. Through ongoing training, incentives, expertise and improved infrastructure, the initiative aims to empower dairy farmers to increase both the quantity and quality of their milk. Work is underway to expand from five initial villages (Kolhar, Ozer, Bhandgaon, Bel-Pimpalgaon and Nimgaonwagha) to five additional villages by the end of 2016, with the goal of reaching up to 1,500 farmers. Crucially, the effort aims to provide a reliable, sustainable market that supports transparent, consistent prices based on quality of milk. Indeed, dairy farmers are already beginning to benefit from premium prices for better quality milk. Like many of these farmers, Gaurav has ambitious goals for the future, including using his profits to embark on social projects for his community, such as building a new school. He wants to keep experimenting with better animal husbandry methods and expects his farm to become world-class. Looking ahead, the goal is to establish a commercially sustainable model that can be scaled up in additional communities. By working together to bring farmers into the organized dairy industry, Abbott, Prabhat Dairy and TechnoServe are working to improve the milk supply chain, while helping farmers to build better lives and stronger communities.